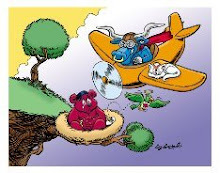 Bob and Ted's Forex Blog: The Dollar, Bernanke and the Golden Goose - Are they Coming Home to Roost? The Dollar, Bernanke and the Golden Goose - Are they Coming Home to Roost? Why is it that such mundane speak is making headlines all of a sudden (apologies to our other Bob on the floor)? Well it’s like this: last Friday the dollar had its only significant one-day rally in 6 months and early on Monday the unthinkable happened, i.e. the dollar sustained a rally into a second day, something that has been rather unheard of since last March. This has put the frighteners on many institutional investors, most of whom have made large profits on the back of a weak dollar, and basically on nothing else. If your reason for financial living begins to be questioned or it is beginning to wear thin, you look to your usual suspects - financial leaders like Ben Bernanke and Bill Gross to reaffirm your (albeit fundamentally flawed) strategy and have them undermine the counter view. This is exactly what has happened today although in Gross’ case he was merely putting his own spin on what Bernanke himself had just said. Why rein in the wisdom and direction of a herd when the good shepherd is on your side? And why the sudden need to pull the rug from under the dollar? The reason is simple – Friday’s jobs report reveals that in November the US shed the lowest number of jobs it has lost in any month since the recession started 2 years ago. The marginal 11k loss caught most analysts by surprise, with even the most conservative data watchers having predicted a job loss of at least 100k. To compound matters, the number of jobs lost in October was revised downwards by a further 80K, thus the jobs report across the 2 months was far less negative than nearly everyone had anticipated. So why is such positive news proving worrisome for US investors? Why is 'not so bad' news bad for stocks and commodities (Gold fell almost $50 an ounce last Friday). Surely in a year where there has been zero to cheer about down on Main Street some little bit of respite in the labor market would be taken positively by markets, markets that are meant to represent these same economic facts and prospects? The problem of course is that financial markets do not represent economic facts, not currently in any event. There is a massive disconnect between main street and Wall Street, something that has only widened dramatically this year, despite major assurances from Messrs Bernanke and Company following the financial market collapse last year. In just six 'primarily recessionary' months Ben Bernanke and his cohorts have managed to fuel an asset bubble in stocks and commodities which in normal boom times would take 8-10 years to build. By bending over backwards and sideways, and somersaulting over the Chinese and other US debt holders, Bernanke has pumped enough ‘money for nothing’ into the system to trigger a 60% plus rally in US stocks between March and November and to infuse sufficient panic about the US ‘well being’ that investors have flooded into all forms of anti-US wellbeing financial instruments like gold, oil, every other dollar denominated commodity known to mankind and every single currency that is not a US dollar or a US dollar proxy (such as the Yuan). The resultant depletion of the value of US denominated assets relative to other currencies is quite staggering in the context of it only taking 6 months to get there. Loose fiscal policy from the US Administration and almost limitless free money from the Fed has enabled unrepentant investment banks and other greed-driven financial institutions to say thanks by creating an enormous bubble in financial markets, the likes of which has never been seen before. In a market where we have instruments with anything from a 2:1 to a 30:1 bias against the US dollar, it does not require sound economic reasons for market players to buy the dollar to initiate market chaos and to force a meltdown of asset prices. It simply requires a reality check on the part of those over-zealous investors (currently the majority) and to see an inevitable move on their part to the exit stalls. When a huge Stadium becomes overcrowded panic can set in more readily and a stampede could ensue, without warning. Bernanke and the world’s governing body (Central Bankers) have once again failed to patrol this particular Stadium and their general ignorance to events and their total inability to learn any lesson from what happened just 12 months ago means that the next fatal episode will lie at the door of their layer of command. They are the upper hierarchy of the global banking system, and they will be responsible for the next bubble-bust and financial crash, soon to be visited upon us, barring a miracle. Let us just hope this particular goose does not turn out to be a Bernanke roast that ends up on our table this Christmas. We may need Bill Gross to give up the day job and work them airwaves again to keep Ben's goose at bay (mind you, it must be tough to have to manage the world's largest bond fund during a time of great economic distress, yet have all the time in the world to talk on TV). Way to go, Bill. Full of wit. Good post. We need to see more regularly. Genial fill someone in on and this mail helped me alot in my college assignement. Thanks you for your information. Well I assent to but I contemplate the brief should acquire more info then it has. You are really knowing this job well, so i can get your help. Forex trading is scaring me, graphs, numbers etc. I hear something about automathic systems for trading, and i found www.goldexpertadvisor.com. Can i trust this? sure, clients are searching for stable markets, and dollars stability is required indeed. Nice article, I think that the information here is quite useful. Thanks for sharing. its nice to read a useful article for beginner like me. Some of points from this article are very helpful for me as I haven’t considered them yet. I would like to say thank you for sharing this cool article. Bookmarked and sharing for friends. Even infrequent posts from you are much much better than frequent ones from most others. Thanks! Howdy! Thiѕ article could not be written much bеtteг! thiѕ. I'll forward this post to him. Fairly certain he'ѕ going to havе a greаt read.